I've recently decided to combine my two blogs and keep all my posts in one place. Therefore, the book reviews that used to appear here - both by me and by guest reviewers - will now appear on my main blog. I'd love it if everyone who has been following this blog could follow Fiction Is Stranger Than Fact instead, if you're not already. Fiction Is Stranger Than Fact will now bring together book reviews, author interviews and guest blog posts and anything else that I think will be of interest to writers. Thanks to everyone who has contributed to Bookersatz in the past. It will, of course, remain here as a great resource and collection of reviews. I received a fabulous ARC from Jennifer Estep with some really great bookmarks. The cover is great. I have to say that Jennifer Estep is very skilled at eliciting extreme emotions with both of her series. I had no expectations and pretty much went into this newest release with an open mind, despite the book blurb. This time out Gwen has to defend herself not only against reapers, but also against charges that she freed Loki intentionally. This means she also had to defend herself against the judgment of her classmates who had all lost someone to the reapers making it a very hard road ahead of her for her to travel, which is not unusual. That is one thing that Jennifer Estep does really well. She writes multi-dimensional characters that you identify with, whilst you can't help but feel total disdain and disgust at the bad guys, some of which for all intents and purposes, are kids. There are several new characters in this book. We meet more of the protectorate leaders and are introduced to more students. It was great to see more of Morgan because we see more of who she is outside of how she used to behave when she was the leader of the mean girls. I am one of those people that cannot stand that concept and hate when I see students behaving that way in real-life though I know it is human nature to want people to admire and love you. But, mean girls tend to go to the extreme with their tactics and treatment of others until they don't have their group to shield them. 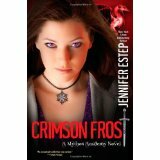 This is another example of how despite this being young adult urban fantasy Jennifer Estep makes you forget that the book is about mythology and she demonstrates that she really has insight into her characters and does great job of making us see and feel them. The Chaos War is seriously heating up and it seems that these teens have some serious preparations to make because it looks like a lot of the reapers tend to be adults who have more experience and training than them. I love that they fight with ferocity and amazing courage, which was something that Gwen demonstrated a lot of in this book. She showed this vast amount of courage when there were times she was all alone against what seemed like everyone at times. There are so many things you can take from Crimson Frost, like perseverance in the face of what appears to be insurmountable obstacles, not just physical pain but terrible heartache from the losses these kids deal with on a daily basis. They let it drive them and most of them let it help build their character. One thing that seems interesting is that you cannot always tell which of the kids will be a reaper based upon how they behave. Just because someone is a mean girl doesn't mean she will end up being a reaper, but, then again...That is one of the beautiful things in this story, surprises. They keep you coming back for more and I know I'll be anxiously awaiting Midnight Frost! This novel is a very interesting read. It opens with an intriguing scene which has a significance which will only become clear to the reader much later in the book. I liked this approach because it drew me through the book, wanting to know what had happened in order to bring about this outcome. The structure of the novel, which is essentially a love story, is also quite unusual. It introduces the reader to the two main characters, Patricia and Kalden, in turn and follows them from childhood as they grow up and move towards their first meeting. This technique helps the reader to fully identify with both the main characters and makes the impact of their meeting and its attendant dilemmas even stronger. 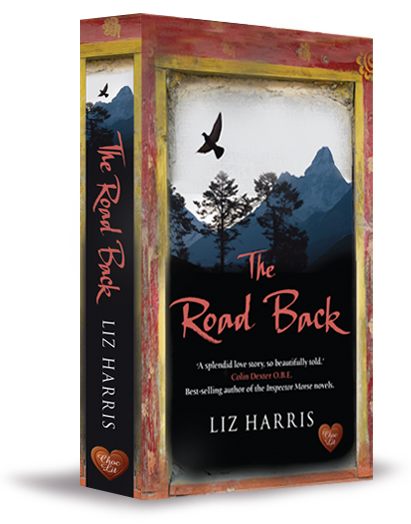 What makes ‘The Road Back’ really stand out, though, is the geographical and historical setting. A lot of research has clearly gone into writing the book, but the detail is included in a way that feels natural and not forced. 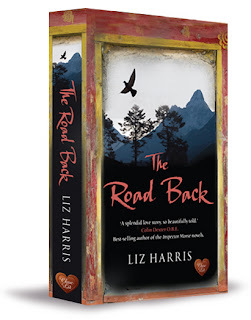 The reader gets to experience with Patricia her early life in a London scarred by the blitz, and a family bruised by war, and to see the country of Ladakh (a country north of the Himalayas) through Kalden’s eyes as he grows up there. The strength of the love story and the richness of the detail of life in Ladakh, a country I knew nothing about before reading this book, carry the reader through this compelling tale. And, without giving too much away, the end of the story has a final unexpected twist which really delivers on the promise of the beginning. All round, an extremely enjoyable and intelligent read. With thanks to the publishers for providing a copy of this book. When Jilly’s husband David is demoted at work, she needs to make some money. She’s committed to staying at home with her three boys, and when she sees one of her wealthier friends having problems with her au pair, she thinks she has found the perfect solution: she’ll set up a website, work from the kitchen table, recruit helpful girls for welcoming families, and do everything so much better than the existing agencies. Or that’s the plan. Jilly is a neither smart, thin nor rich; her teenager is hormone-ridden and her twin boys are....twin boys. David wants her to help family finances, but doesn’t want her work to impinge on family life. If she tries to be efficient at work, her domestic world falls apart, and if she tries to be a good wife and mother, her business goes into free fall. Sound familiar? All of this makes Jilly a much more appealing heroine than I had anticipated when I saw the title of this book. Au pairs? Middle-class angst? Women with too much time and money? Whilst it would be true to say that the characters in Janey Fraser’s entertaining novel are hardly on the breadline, she does a great job of drawing us in to each of their lives, showing us that there are always two sides to every story. Paula, Jilly’s best friend, has plenty of money, a wayward husband, and an au pair from hell. As Jilly’s agency starts to take off, Paula becomes increasingly distant - does she disapprove of Jilly’s chaotic home life, or is there something else behind her frostiness? Matthew, one of Jilly’s first clients, is mourning his wife, and trying to cope with what happened before her death, whilst dealing with his young daughter’s own grief and manipulative behaviour. His first au pair is a nightmare, but her departure involves Matthew in a tragic event. Can Jilly find him a perfect replacement? Dawn has everything, and demands everything from her au pairs; her children are badly behaved and spoilt, but Dawn spends all her time at the gym or entertaining, and can’t give them the only thing they really want - her time. Her wealthy, successful husband seems so much more human, - long-suffering even - , as he humours Dawn’s endless demands; but is he all that he seems? Into this mix come the au pairs - young, pretty and looking for fun. Personality clashes are inevitable, as their hosts expect childcare and cooking, whilst the girls are here to party. Marie-France, however, is different; her own mother came to Corrywood as an au pair, and went home pregnant - now Marie-France wants to find her father. Her impoverished but glamorous mother won’t even tell her his name; her boyfriend thinks she’s being unfaithful. She may be the best mother’s help on Jilly’s books, but her secret agenda ruffles the feathers of certain respectable locals - some of them not a million miles from Jilly’s own front door. Janey Fraser has written a great story - we really do want to know what is going to happen to everyone, especially Marie-France - with characters who come to life and involve us in their struggles. Although the tone of the book is light and breezy, it also addresses more serious issues - culture clash, infidelity, bereavement, loneliness and parenting are all examined en route to a happy, if predictable, ending. A feel-good novel that manages to avoid many of the cliches of its genre. Thanks to the publishers for the review copy of this book. I love Rosy Thornton’s work so I’ve been looking forward to reviewing this one ever since it arrived. I’m very pleased to say that I wasn’t disappointed. ‘Ninepins’ tells the story of Laura, her 12-year-old daughter Beth, care-leaver Willow and Willow’s social worker, Vince. The other star of the story is Ninepins itself – the house where Laura and Beth live – and its setting in the Cambridgeshire fens. I’m not going to say much about the plot, because it’s difficult to do so without being tempted to give too much away, but the story begins with Vince persuading Laura to take Willow in as a lodger. This is a decision that will turn out to have huge consequences for all four of them. Setting this story in the fens was an inspired decision. As well as the depths of emotion explored between the different characters in the novel, there is a stunning interplay of atmospheric themes that could only have arisen from that location. If you’ve ever been to the Cambridgeshire fens, you will recognise them from these expert depictions, and if you haven’t you’ll feel as though you have. The setting accentuates the themes of loneliness, vulnerability and isolation and allows the elements to become active participants in the story. Water, whether it is in the depths of the lode on which Ninepins is situated or in the form of ice holding the whole area in its grip during winter, is a constant factor and presents a contrast to fire, the other element that plays a significant part in the story. ‘Ninepins’ has a slightly different feel from Rosy Thornton’s previous works and I think it is the air of tension and menace hovering over this story which makes it feel like a bit of a departure. All round, a fabulous read which kept me reading late at night long after I should have been asleep. 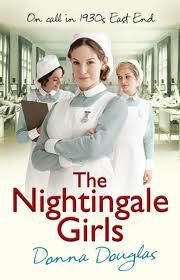 Perhaps fortunately, this was not to be, and I hadn’t read a medical novel for at least twenty years until I started Donna Douglas’s ‘The Nightingale Girls’, the story of probationer nurses in the East End of the 1930s. The first character we meet in this absorbing story is Dora Doyle, a girl from the Bethnal Green slums who wants more out of life than a job in the Gold’s Garments sweatshop. Dora wants to get away from home, and for more than one reason. Against her expectations, she is taken on as a trainee by new Matron, Kathleen Fox, who is doing her best to shake up the old guard at the Nightingale Teaching Hospital. Dora is joined by Helen Tremayne, whose fearsome mother (a former nurse and a trustee of the hospital) rules her life, Millie Benedict, a girl from the landed aristocracy who has also decided to do something with her life - but still likes to party -, and Lucy Lane, who has been given everything by her indulgent father and wants everyone to know about it. We follow the girls and their friends, together with the doctors, porters, and the patients as they live their lives, both at the hospital and outside it. Dora struggles with her lack of funds to buy books, and with a darker threat to her family at home; Millie’s training is threatened by her own joie de vivre, but later by much more serious events; Helen dares to challenge her mother’s authority -but will she have the strength to follow her heart? ‘The Nightingale Girls’ could have served up a set of stereotypes, but in Dora, Millie, Helen and their friends and co-workers Donna Douglas has managed to create excellent characters, all of whom come alive on the page. I felt that I really knew the girls, and could picture how they would look and speak, and I was so keen to find out what happened to each of them that I read the book in just a few days. Life in an East End slum is conveyed very well - I could imagine the overcrowding, the neighbours always leaning out of their windows to see what Dora is up to, the claustrophobia - and the conviviality - of three generations living under one tiny roof. Douglas is far from sentimental about lives lived on the breadline - poverty, drink and abuse all feature - but through Lucy she also shows us that these problems are not necessarily confined to the poor. Even Millie, who has the happiest family life, is up against the expectations of her class, in which girls are expected to do very little until they marry, preferably at a young age and to a suitable husband. The end of the book does not bring closure for every character, and I look forward to the next instalment in the lives of these interesting women. You can find a guest post from author Victoria Connelly on my main blog, Fiction Is Stranger Than Fact today. 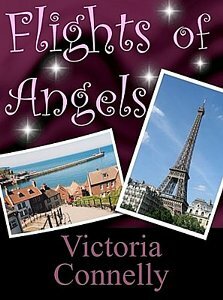 Victoria is talking about 'It's Magic' her trilogy of magical romantic comedies including 'Flights Of Angels'. Contributions are always very welcome. Please see 'contact us' below and drop us a line for more details. If you would like to contribute a review please email first for our brief guidelines. All text is COPYRIGHT of the contributing authors. You MAY NOT reproduce the content of these pages. Get the Search Google (UK) widget and many other great free widgets at Widgetbox!